Commelinaceae. Zones 10-11. Makes a great groundcover in light shade or a hanging basket subject indoors. 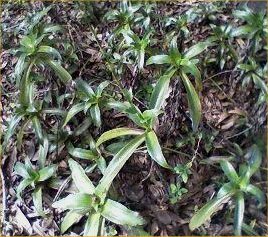 Individual leaf rosettes are a pretty, shiny green with a slightly reddish hue toward the center, resembling a bromeliad. The plant reproduces by stolons, new plantlets forming at the ends. Fragrant stalks of small white blossoms in summer. Very easy plant to cultivate, outdoors or indoors.